You need to have a few specific dimensions at hand before building stairs. The first is the vertical height from the deck surface to the ground where the steps will be located. This is called the rise. The second measurement, called the run, is how far out your steps will extend horizontally. There will always be one LESS tread than rise. Generally, the sum of one rise and one tread should equal 17” or 18”. The comfort level of you and your guests ascending and descending stairs is affected by the rise and run configuration. A higher rise and shorter run will cause the body to stand straighter and take shorter strides. A lower rise and longer run will cause the body to lean forward and take a longer stride. The third measurement is the width of the stairs. This is measured from the outside of one stringer to the outside of the other. If your stairs are for minimal access, then 36” wide is fine. With two people side-by-side, then maybe 4’0” would be better. Some other considerations might be: how many stairs will access your deck, where will they be located and their physical configuration in relation to the deck. This example deck is twenty feet wide. You could put a stair at each end or one very wide set of steps at the front. Stairs have three basic parts. What you step upon is the tread. What you trip on or otherwise accidentally kick thus bruising your toe is called the riser. The two sidepieces that hold it all together are called the carriage or stringer. Deck stairs usually don’t have risers. They are built open (with the risers is a closed system). The wider your set of stairs, the more stringers need to be used. Consider using one every 18” to 22”. Stairs 3’0” wide with light to moderate traffic need have only two stringers. You probably should have a concrete pad at the bottom of your stairs too. 4” thick by 2’0” deep is okay. The width should extend past the stairs, on both sides, by about 6”. Check your local building codes. 6 7/8” high. This will probably be okay. As to the depth of the treads, you’re pretty much on your own. Try to keep them to more than 9”. If you lay 2 - 2x6’s next to each other, you get an 11” tread. Using 3 - 2x4’s will give you a tread that’s 10 1/2”. These two suggestions are the most common. They also allow you to use a 2x12 for the carriage. If you want to have deeper treads, then you’ll have to use alternative materials for the stringers. Cutting carriages can be a challenge. You can buy precut carriages (saving you time but not money) or you can buy a framing square (a right-angled metal ruler) and a stair gauge (pair of small, brass screw clips used on metal rulers to mark a point). These tools will enable you to mark off your rise and run on a board and make your own stringers. Clip the gauge to the ruler marking the appropriate height of each rise and depth or each tread. Then align the gauge along the same edge of a 2x12 and trace the right angle to be eventually cut out. Stairs are always described from the bottom up. Laying out your carriage is done the same way. Repeat the tracing for each rise and tread of your stair. To determine the length of wood necessary for the carriage, add three to the number of risers in you stair. Remember boards are sold in even lengths. The top end of your stair carriage needs to be horizontal and parallel to all the treads you have marked. Cut the board completely through at this point. The bottom end needs to be vertical and parallel to all of the risers you have marked. Keeping in mind that the carriage represents the third side of your triangle and thus angled, it is necessary to cut the bottom so it lays flat on the concrete pad. The other two sides of the triangle are the height of the deck, the rise, and the horizontal measurement from the sum of all the treads. This cut is parallel to the tread and should also be cut completely through the board. You need to cut the top of the stringer so it lays flat against the header its being nailed into. This cut is parallel to the riser and it too is cut completely through the board. 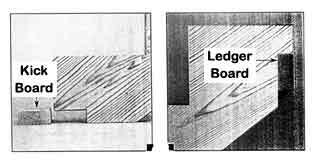 The use of a kick board and stair ledger board is optional although it will make your stairs sturdier. You may want to consider it if you expect heavy deck usage. Using a circular saw, cut along the lines until the saw blade just touches the intersecting line. Cut inside the lines, on the part to be tossed out. Using a hand saw, grip it backwards and cut the remainder of the wood. This will be a little awkward but the result will be a clean corner at the intersection of the rise and tread. There is a third alternative for stringers. You can buy stair cleats of metal that are screwed into the stringer and treads from the underside. You need not cut carriages at all. These heavy steel brackets allow the tread to rest upon them giving you a boxed set of stairs. With a boxed set of stairs, when you look at them from the side, all you see is the carriage. On a boxed set of stairs, all of your balusters will be the same length and cut the same way. On an open set of stairs, you will see the treads from the side. The balusters from your railing will be square-cut on the bottom, but different lengths. You will use at least two per tread per side. The height of the first should be about 36” while the second will be about 39”. Of course, the height of your railing is also governed by building codes. Assembly is pretty straightforward. Install the carriages first. Do the treads second and the railing is last. All of this instruction is based on the carriages being nailed directly to the front or side header of the deck. You may wish to build a small platform adjacent to the deck off of which the stairs are attached. 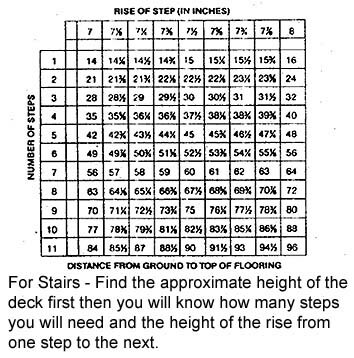 This is most likely the scenario if your deck is higher off the ground and/or your stairs make a 90° turn. If you consider this platform to be just another deck, and build it much the same way, it’s not so daunting a task. Your deck is merely a little more complicated. Now you really have completed your deck. Kick back, enjoy and congratulations.